SINGAPORE, Feb 12, 2018 - (Media OutReach) - Today, Oath announces a global deal with Mediacom and Shell to take the energy brand's "Make the Future" campaign into its next phase. 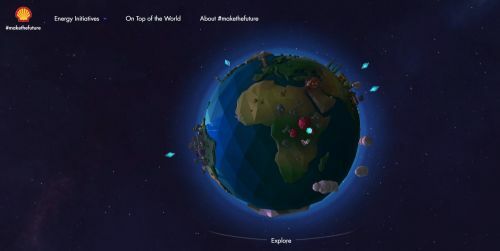 The new phase brings the content of its "On Top of the World" music video to life through a crafted WebGL "Globe" activation, created by Oath's RYOT Studio global solutions team in collaboration with UNIT9: allowing people to explore the five cleaner energy projects featured within the music video through its interactive design. The music video itself features five global artists and celebrates five cleaner energy solutions supported by Shell across four continents that are helping provide access to cleaner energy and support local communities. This content will reach Oath's millennial and mobile audiences across five markets (US, UK, Brazil, Singapore, and India) using Tumblr and its Yahoo Gemini and BrightRoll premium video distribution and syndication channels, driving audiences to the interactive "Globe" to explore the content. Working with Mediacom, the new content activation was conceived by RYOT Studio's global solutions team at Oath as part of Shell's "Make the Future" campaign, highlighting the power of collaboration in order to provide cleaner energy solutions. The company believes the world needs new ways to generate and use cleaner energy. Access to more and cleaner energy has the power to change lives. Achieving this will require more than one technology or one person - it will take many working together. The campaign will reach relevant audiences at scale across devices in each market, using data insights from Oath's one billion users globally and distributing the On Top of the World music video using native video formats in Yahoo Gemini, as well as premium video formats on Tumblr, BrightRoll and branded video syndication network. Becky Jones, global business director at Mediacom, said: "At Shell, collaboration and partnership is incredibly important to address tomorrow's energy challenges. In this spirit, we're really excited about the output of a productive and collaborative partnership between Shell, Mediacom and Oath. We're looking forward to creating deeper engagement with Shell's audience, via a connected system of relevant Oath assets, to positively enhance the image of the Shell brand." John DeVine, Chief Revenue Officer at Oath said: "The future of energy is an important global topic. Our team worked with Shell and MediaCom to bring a new, interactive angle to their music video that engages audiences around this message. By combining the creativity of RYOT Studio and Tumblr with our premium video distribution channels, we've created a holistic experience for millennials across five markets to explore projects that Shell has highlighted as helping solve tomorrow's energy challenges." Shell believes by working together we can transform lives by bringing more and cleaner energy to communities, everywhere. Shell collaborates with inventors, local communities, engaged citizens and global celebrities to transform lives by putting bright energy ideas into action. The Shell #makethefuture programme is not just talking about it but doing it - on the ground, day by day. Each of us has a role to play - as inventors, funders, volunteers, donators or vocal supporters.